A few lucky directors have one film where all of the elements come perfectly into alignment. Lucio Fulci managed to pull of this feat for an entire quartet of supernatural horror classics, often referred to as his zombie cycle. Made by Fulci hot on the heels of a string of excellent gialli and westerns, Zombie, City of the Living Dead, and House by the Cemetery are all well known and revered among horror fans, but The Beyond (L'aldila) is arguably his masterpiece. Oddly enough it was also virtually unknown for many years, with most American fans unfortunate enough to be stuck with a brutally edited, rescored version entitled 7 Doors of Death (released on Thriller Video back in the early '80s and rarely seen since). 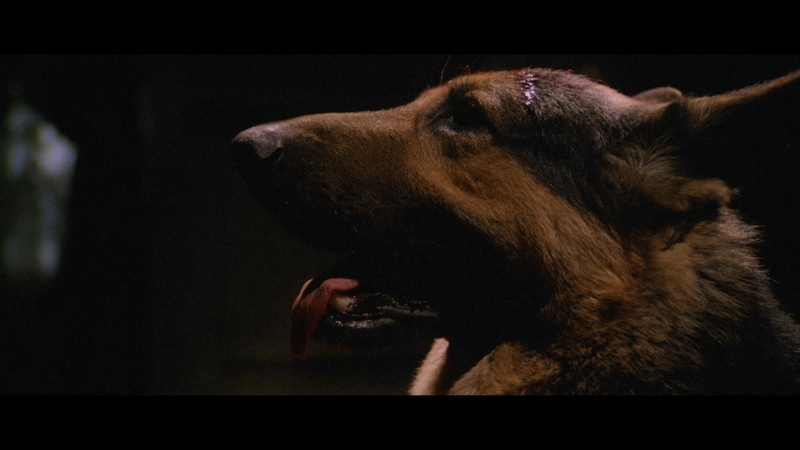 When the original cut of The Beyond finally surfaced on Japanese laserdisc in the mid-'90s, the floodgates opened and the film's reputation went through the roof. That led to an unlikely theatrical release from Grindhouse and Quentin Tarantino's Rolling Thunder Pictures on the midnight movie circuit and what now amounts to several generations of cult followers, not to mention a midnight screening on Turner Classic Movies that led to a particularly vocal response from regular viewers. Apparently ol' Lucio still hasn't lost his touch to shock and upset the status quo. During a sepia tone prologue set in 1927 Louisiana, a group of men arrives by boat at the Seven Doors Hotel. They burst into Room 36 and proceed to chain whip the inhabitant, a painter and warlock named Schweick. Meanwhile a young girl downstairs named Emily (Keller) reads from an occult text called the Book of Eibon, which erupts into flames as Schweick's face is dissolved with acidic sludge. In 1981 the abandoned hotel is under renovation thanks to the new owner, a relocated New Yorker named Liza (MacColl). When one of the handymen suffers a bloody accident on the scaffolding, the local doctor, John McCabe (Warbeck), is called in to keep things under control. A number of bizarre incidents occur beneath and around the hotel, such as constant ringing from the bell in Room 36 and a gruesome fate for poor plumber Joe (De Nava). During a car trip along an eerie causeway Eliza first meets Emily, who still looks exactly the same except for her eyes, which have turned a milky white. Other "accidents" at the local morgue and a book shop indicate that the Book of Eibon holds the key to the hotel's dark secret, with a cryptic gateway to Hell housed somewhere within the property. Ultimately the humid landscape is beset by shuffling zombies, with Liza and John frantically fighting for their lives as they attempt to close that which should never have been opened. 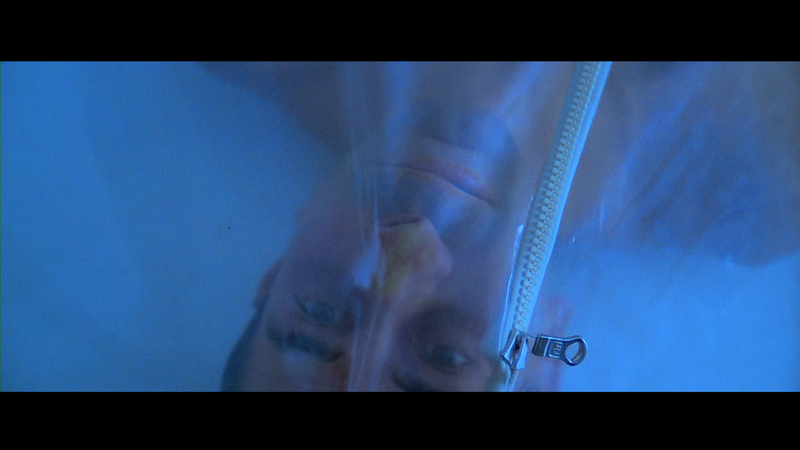 By most rational standards, The Beyond can be a confounding experience. The plot has little to do with linear story properties or rational development, and the acting is highly stilted and often awkward. 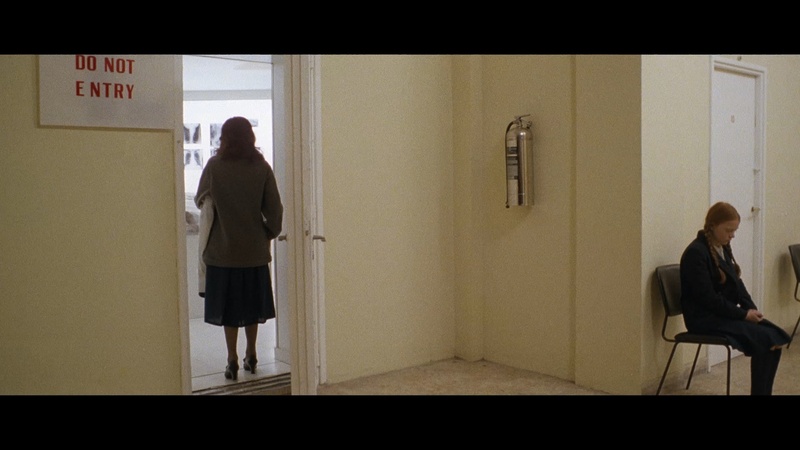 However, any Fulci fan knows that when the filmmaker has kicked into high gear, these are really attributes, not flaws. The lovely and endearing MacColl served as leading lady in three of his best zombie films; apart from being a first rate screamer, she's a terrific protagonist and seems to be enjoying herself. 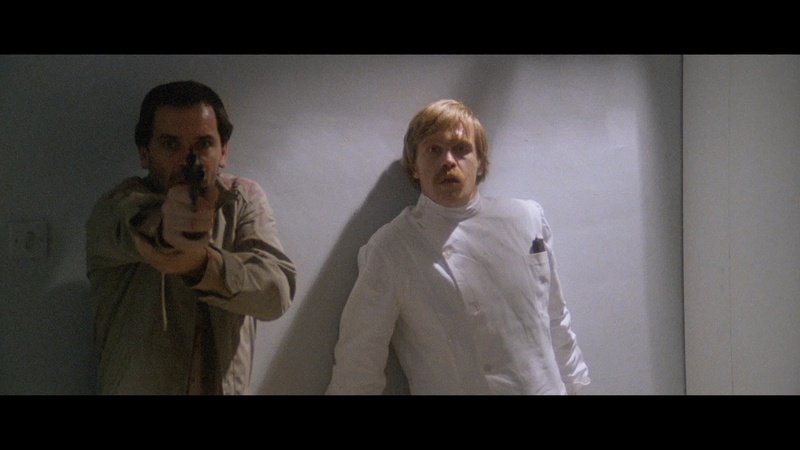 The late Warbeck carved a niche for himself in British and Italian exploitation titles during the '70s and '80s, and his rugged leading man qualities are put to excellent use here as he turns from concerned family physician to pistol-packing defender against the undead. Their characters are more warm and engaging than they really have any right to be, which makes the poetic and thoroughly chilling ending all the more powerful. 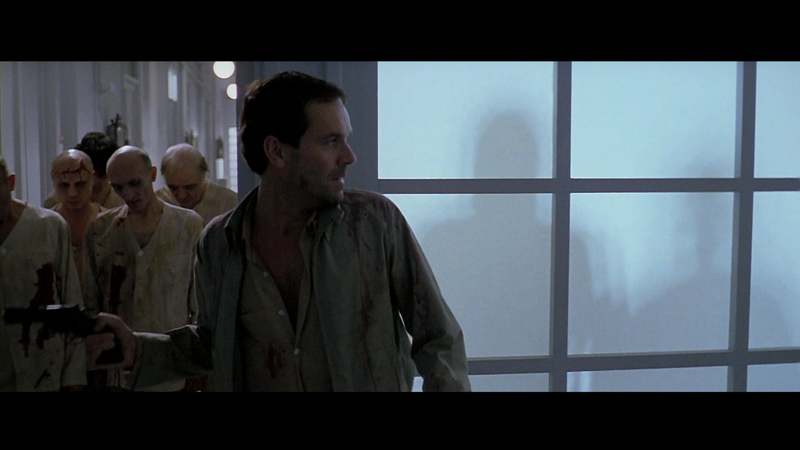 If anyone ever questions Fulci's abilities as a filmmaker, kindly direct them to the last 90 seconds of this film. The special effects by splatter maestro Giannetto De Rossi are also effectively repellent, with eyes popping from their sockets and faces blending into mush. 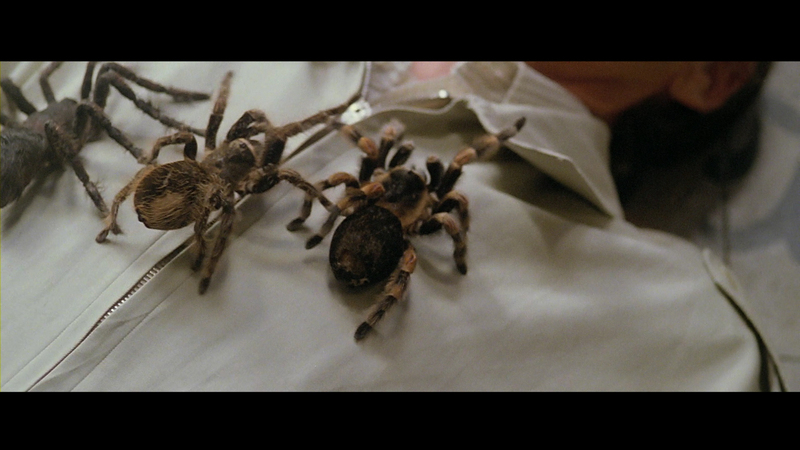 The legendary, painfully slow tarantula attack sequence is both stomach churning and darkly hilarious, with squeaking arachnids covering one poor victim and casually removing portions of his face with their... teeth, apparently. All of Fulci's most noteworthy collaborators attack this film full throttle, with the amazing Sergio Salvati pumping up the atmospheric lighting across the scope frame and Fabio Frizzi manipulating piano solos and electronics into a tremendous music score. Forget what mainstream critics like Roger Ebert had to say; this film is a heartfelt poem for horror fans and, most importantly, a gory good show. The distribution history of The Beyond has been unusually tangled over the years with more than its share of drama. When Rolling Thunder stepped in for the theatrical release, the video rights first went to Miramax. Unfortunately their owner, Disney, wouldn't even consider allowing a laserdisc release in the late '90s despite the massive amount of supplementary material compiled by Grindhouse. The title drifted in limbo for a while after its theatrical run, with a decent Region 2 DVD from EC Entertainment turning up in Holland of all places. Finally the licensors made a deal with Anchor Bay, and years later the DVD finally hit the market. That disc offers several audio options: a thunderous 5.1 remix, which offers some wild and amusing separation effects to the rear speakers and increases the scare value immensely; a 2.0 surround version of the same mix; the original mono soundtrack for the more nostalgic viewers; and the original Italian audio track, which is much better than average and invests the film with some welcome dynamic, emotional shadings. Though the packaging makes no mention of it, the disc also includes optional English subtitles, a very welcome addition. The most notable special feature here is the commentary track by MacColl and Warbeck, recorded while the latter was on his deathbed. You'd never guess it, though; this is easily one of the best commentary tracks ever recorded and never lets up for a moment. The two actors show a great deal of respect for Fulci and the film itself while poking fun at the filming experience, cracking jokes and making some astonishingly witty observations about the action onscreen. The affection and knowledge shown by this pair cannot be overstated, and it's extremely satisfying that their comments can finally be heard. 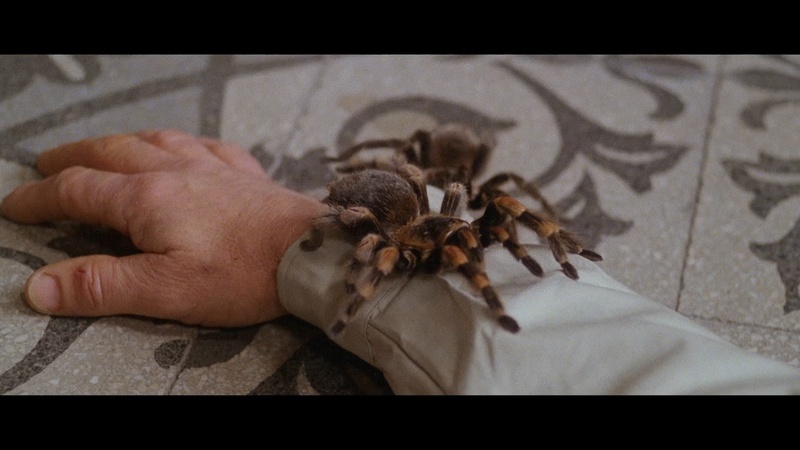 Check out Warbeck's method of soothing MacColl's queasiness during the tarantula scene for an especially good chuckle. The DVD also includes the international English trailer, the Rolling Thunder reissue trailer (with a slightly different opening), a similar German trailer, and a file of cast and promotional photographs and artwork. An alternate color version of the opening sequence has also been recovered from the German release version, and obviously, it's much more disgusting seeing Schweick's bloody chain wounds and candy colored face melting in full, MGM-style Technicolor. Necrophagia's music video for a thrash metal song called "And You Will Live in Terror," directed by Jim Van Bebber and featuring clips from the film, is also included but will probably only appeal to a select few out there. Easter Egg hunters out there can also follow the Eibon symbols and see the original U.S. opening for 7 Doors of Death and a trailer for Fulci's latter day postmodern horror opus, A Cat in the Brain. The Anchor Bay disc eventually went out of print and was resuscitated directly from Grindhouse, essentially adding on a video intro with MacColl and retaining all the contents of the deluxe tin edition (without the turbo packaging, but anyone suffering from shelf space woes should be thankful). They also throw in 20 minutes of new interviews with cast members excerpted from the Paura Fulci epic retrospective (along with most of the major living crew members, including De Rosi). In 2011, Arrow Films took a stab at the film for a much-touted Blu-ray and DVD release in the U.K. complete with a fresh new transfer from the original Italian negative. 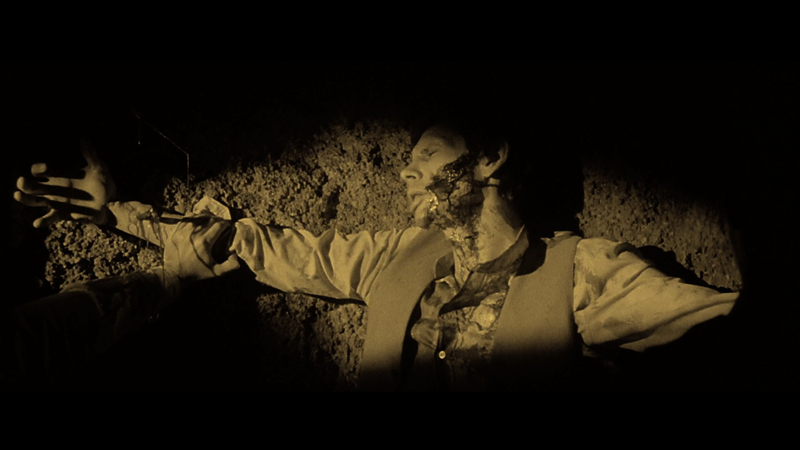 The initial release was plagued with a faulty initial pressing in which the sepia-toned prologue was incorrectly presented in black and white, and the entire film and extras were crushed down to a single BD-25 disc. That was quickly corrected, and the troublesome discs have been gone for ages. The transfer looks pretty good but has been subjected to some hit and miss noise reduction, with an occasionally noisy texture in outdoor scenes. 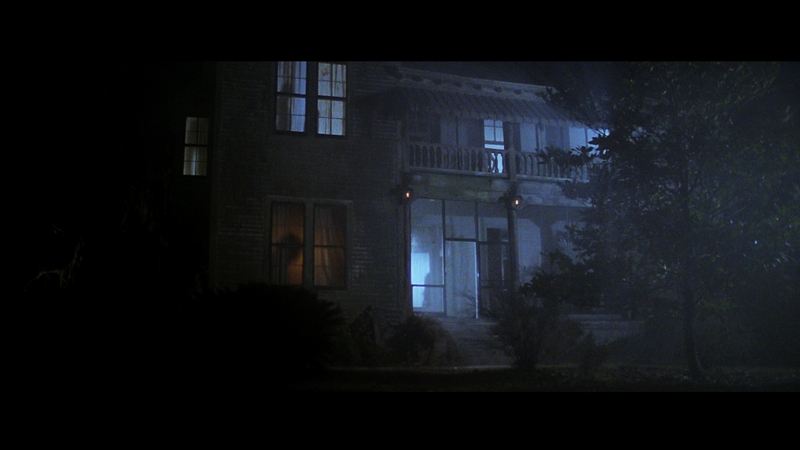 It's far better than the more disastrous Italian-sourced HD mishaps out there (and a few notches above House by the Cemetery, thankfully), but there was still room for improvement. Audio options are similar with English 5.1 (DTS-HD on the Blu-ray), plus English and Italian mono with subtitles. Extras include the Warbeck/MacColl commentary, an additional one with Fulci's daughter Antonella (who was a teenager at the time and has a lot of stories to share), a 26-minute interview with Monreale, a 2010 appearance by MacColl for a screening in Glasgow (for a 21-minute Q&A), and the usual elaborate reversible packaging including a written fan piece by Eli Roth and a Cliver interview by Calum Waddell. Of course, this was also one of Grindhouse's most highly-requested titles for Blu-ray, so anticipation was high when they unrolled their own double-disc edition in 2015. As expected, it's a hugely expanded treasure trove of goodies for fans, while the transfer appears to be from the same solid source but with less digital manipulation. It's still imperfect and now a tad dated, but the sheer joy of watching this masterpiece in HD can't be underestimated. The DTS-HD 5.1 mix here sounds awesome with rich, deep bass for the music, which now sounds pretty pale by comparison on the mono tracks (which are still the original mix and the most authentic.) (Again there's English and Italian mono with a two-channel English stereo option as well, with optional English subs.) The film is presented on the first disc along with a sweet new HD intro by MacColl, the alternate color opening pre-credit sequence (this time with German and English options), the usual Warbeck/MacColl commentary, theatrical trailers (international English, German, Grindhouse rerelease, and the full frame 7 Doors of Death one, which outrageously misrepresents the film's plot), plus a 1998 radio spot and a 1982 American one. 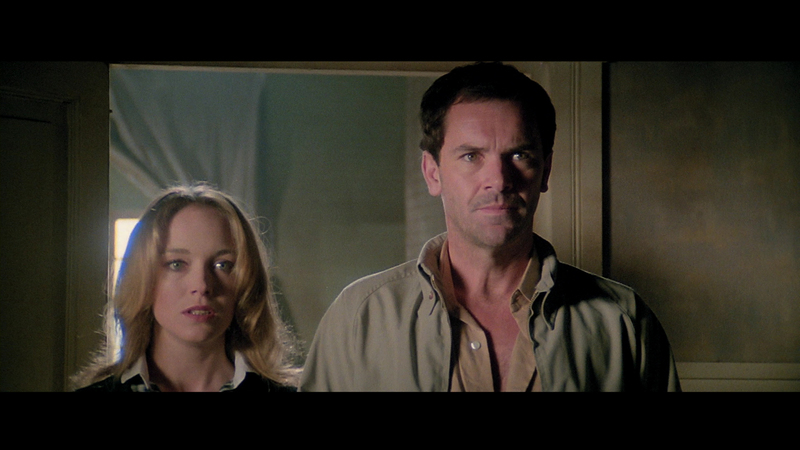 A little extra hunting will also uncover the radically doctored 7 Doors of Death opening titles and a 16-minute reel of stills and promotional artwork interspersed with interview highlights dedicated to the late Fulci and Warbeck. Now on to disc two, an onslaught of extras that will satisfy even the deepest Fulciphile's craving. "Looking Back: The Creation of The Beyond" is a mammoth 47-minute piece with many of the surviving Italian crew members including Salvati, screenwriter Dardano Sacchetti (who offers a nifty anecdote about the film's original jettisoned amusement park finale and the improvised nature of the one we have now), producer Fabrizio De Angelis, and composer Fabio Frizzi, who shows off the Mellotron used to conjure up the amazing score and explains the genesis of the two lines sung in Latin recurring throughout the main theme. Antonella Fulci also pops up for a few fun bits as well including an explanation of how the beloved Eibon symbol came from a tattoo her father hated that she got on her wrist when she was 14! No less essential and far more surprising is the 45-minute "The New Orleans Connection," in which local TV personality Larry Ray talks about how his ability to speak Italian got him the gig on hosting the scouting crew around and working in numerous capacities on the production itself including a role as the ill-fated house painter who shares his first name ("The eyes, the eyes!"). 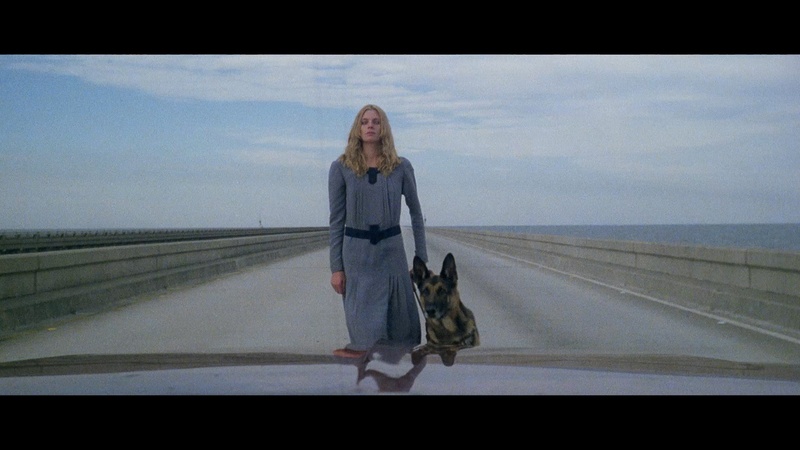 It's a fascinating chat covering all of the wrangling involved with the state's film commission, plus a terrific story about how that now-familiar shot of Lucio Fulci on that eerie causeway came to be (much to the consternation of many commuters). Don't miss the bit about the tarantulas either. 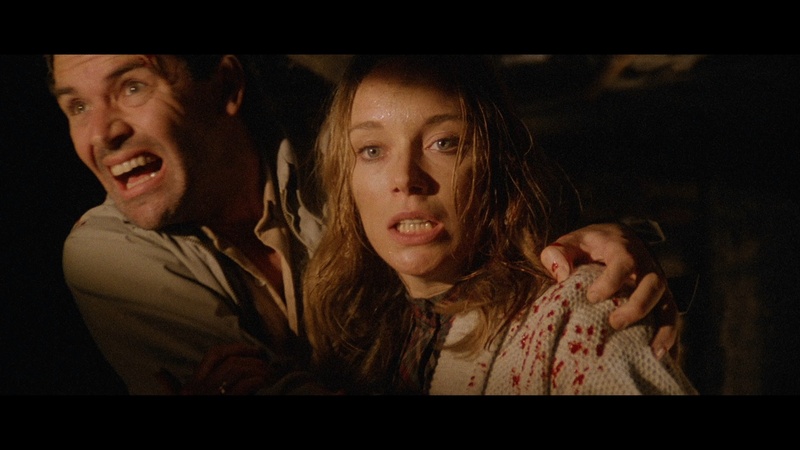 "Beyond and Back" is a new 35-minute interview with MacColl, offering a general career overview and a lot of ground covering her three Fulci collaborations (including her jumping ship before what would have been their fourth, New York Ripper.) She's always fun to watch and good company, with a few of her more colorful tales (like the maggot scene in City of the Living Dead) popping up here as well. "See Emily Play" is a new HD interview (conducted with Freak-o-rama) with Monreale, running 21 minutes and zipping through her story as an actress from her early aspirations of playing Calamity Jane through her professional relationship with Fulci. "Making It Real" spends just over half an hour with makeup god De Rossi (who conjured up most of Fulci's most famous grotesque creations) and special effects artist Maurizio Trani, who discuss the largely experimental nature of their work and creative means of manipulating the faces of actors into zombies. And yep, they cover those tarantulas, too. Shoved at the end of the extras but also well worth checking out is another new featurette, "Beyond Italy," in which Terry Levene (of U.S. releasing company Aquarius) talks about how he scouted out Italian product and made it palatable for xenophobic American audiences including this film and other likes Doctor Butcher, M.D. and Make Them Die Slowly. The rest of the interviews are vintage material including a two-part Fulcli audio interview with Italian film journalist Gaetano Mistretta, running 21 and 14 minutes, with a particular focus on his gothic horrors. There's also a 47-minute Fulci and Warbeck appearance at Eurofest in 1994, taken from a rough VHS recording with iffy audio but still a very valuable artifact of these two men. A six-minute reunion of MacColl and Warbeck two years later at the same fest is also included along with her appearance that same year at Festival of Fantastic Films (a much longer 13 minutes, largely covering material in her newer interview) and Warbeck's at the same event (running 22 minutes). Then there's a heft helping of still galleries divided into five sections: production stills, behind the scenes, promotional materials (from Italy, Germany, France, the U.S., and various), video release art, and "Beyond the Beyond" with other ephemera liked autographed photos and fanzine coverage. Finally there's the usual avalanche of Grindhouse trailers for Cat in the Brain, Cannibal Holocaust, Massacre Mafia Style, Gone with the Pope, Pieces, Corruption, The Swimmer, The Big Gundown, An American Hippie in Israel, Scum of the Earth, The Tough Ones, Ice House, and I Drink Your Blood. The deluxe packaging also comes with a bonus CD containing a remastered version of the film score (the original album sequence, not the reshuffled and expanded disc) and a liner notes booklet containing an introductory note by the late Chas Balun (a major champion of the film on U.S. shores) and an essay by Martin Beine about the film's creative influences including Lovecraft and such films as City of the Dead and Bava's Shock. An epic release no matter how you slice it. Updated review on April 14, 2015.